The arcade has total net lettable area of 8,124sqm and is fully leased to 27 retail tenants and also has four upper floors of office space. 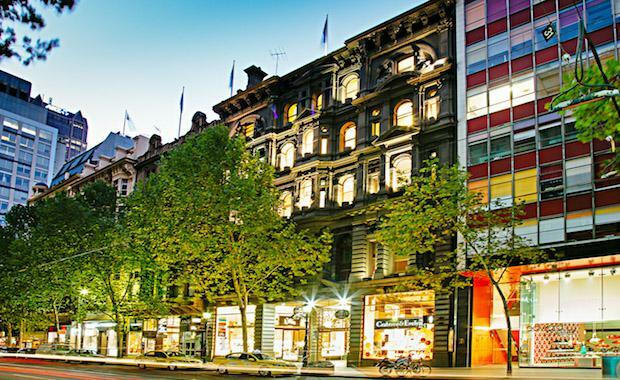 With anchor retail tenants including Telstra Corporation, Orrefors Kosta Boda, Hopetoun Tea Rooms, Haighs Chocolates, Hunt Leather, Crabtree & Evelyn and Wittner, The Block Arcade is expected to achieve a sale price in the vicinity of $100 million. John Marasco, Colliers International Managing Director of Capital Markets & Investment Services, said, "The Block Arcade is a blue chip Melbourne CBD investment. It also offers a number of exciting value-add opportunities including repositioning the asset to attract luxury retail brands to the precinct. We expect interest from local and overseas investors from Asia, Europe and the US. Constructed in 1892, The Block Arcade is a prestigious retail shopping centre with upper level commercial accommodation. It is a Melbourne landmark for its superb period architecture featuring a Victorian façade and mosaic floor under the glazed dome. The Block Arcade benefits from two major street frontages and entrances to Collins Street and Elizabeth Street and there is also a third entrance via Block Place. Allard Shelton Director Patrick Barnes, who has managed the property for 20 years, said, “This property presents purchasers with the opportunity to secure a Collins Street trophy investment as well as the exciting prospect of steering The Block Arcade through the next chapter of its celebrated history. The Block Arcade complex is being offered by International Expressions of interest closing Thursday April 3 at 4pm.